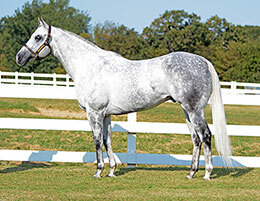 Leading first crop sire Hez Our Secret will stand the 2018 season at Lazy E Ranch near Guthrie, Oklahoma. AUGUST 15, 2017—GUTHRIE, OK—Champion Hez Our Secret, the No. 1 Freshman Sire of 2017 money earners, is scheduled to arrive at Lazy E Ranch in Guthrie, Oklahoma, on Wednesday, August 16. Reliance Ranches, the McKinney family venture whose holdings include Lazy E Ranch, recently purchased one-half interest in Hez Our Secret from Johnny and Jana Trotter of Hereford, Texas. The youngest Champion son of all-time leading sire First Down Dash at stud today, Hez Our Secret leads all freshman sires in the nation in 2017 earnings and in 2017 winners. Among Hez Our Secret’s first crop winners is the nation’s No. 1 earner by a freshman sire. Hez Our Secret is also the only freshman sire with two or more horses that have earned $50,000 or more in 2017. When Hez Our Secret left the track with $887,426 in earnings after his four-year-old season in 2013, he entered stud at the 6666 Ranch in Texas under the care of Dr. Glenn Blodgett, DVM. "We thank Dr. Blodgett for the excellent job he did in getting Hez Our Secret started," said Trotter. "It was a tough decision to move this horse, but when Reliance made the decision to enter into a partnership on Hez Our Secret part of the deal was to move him to Lazy E to participate in the Oklahoma-bred program. "One of the reasons we did not cut Hez Our Secret as a two-year-old is that we wanted to use him on our One Famous Eagle mares," Trotter added. "His bloodlines, speed and conformation all fit what we thought we needed in a breeding horse." Butch Wise, who manages Lazy E for Reliance, said that the 2018 fee on Hez Our Secret will be announced in early September. Hez Our Secret broke his maiden by more than two lengths while qualifying for the $700,000 Rainbow Futurity G1, but he missed the Rainbow final due to a bout of colic. After winning his trial for the Los Alamitos Two Million Futurity G1 by nearly a length, he then ran atroubled fifth in the final. In his championship season of 2012, Hez Our Secret was the nation’s No. 1 money earning three-year-old colt with earnings of $630,252. When Hez Our Secret retired after his four-year-old racing season, the $887,426 earning stakes winner had won or placed in six stakes (4 Grade I at Los Alamitos and Ruidoso). He is one of only a hand-full of stallions that made the finals of a $2 million race at both Los Alamitos and at Ruidoso. Hez Our Secret’s dam (Secret Separation, by Separatist) is a graded stakes placed winner and a multiple stakes producing half-sister to 2006 All American Futurity G1 winner No Secrets Here. The second dam of Hez Our Secret is the 3-time Graded Stakes Winner Dicey Secret. "The greatest thing so far for many of our clients is that his leading money earner is out of a Pyc Paint Your Wagon daughter and his next two stakes horses are out of Corona Cartel daughters. Also, it is no surprise that he seems to have an affinity for the Mr Jess Perry line of mares, as he is devoid of Streakin Six in his pedigree, it also appears he likes Special Effort in his mares. It is early days in his siring career, but these are exciting emerging nicks that offer a lot to breeders and we feel he is a tremendous addition to our stallion roster," said Wise.